EghtesadOnline: The International Monetary Fund, in its latest World Economic Outlook, predicts Iran's economy will contract this year and in the following year as a result of the reimposition of US sanctions against the Islamic Republic. "Prospects for 2018–19 were marked down sharply for Iran, reflecting the impact of the reinstatement of US sanctions," reads the report on IMF's website. US President Donald Trump announced on May 8 his withdrawal from JCPOA and promised to return harshest sanctions in history against Iran, Financial Tribune reported. "The downward revisions reflect to an important extent the worsening of growth prospects for Iran, following the reimposition of US sanctions. The economy is now forecast to contract in 2018 (1.5%) and especially in 2019 (3.6%) on account of reduced oil production, before returning to modest positive growth in 2020–23." The first round of renewed US sanctions reimposed on August 7 prohibits Iran's purchase of US dollars and precious metals, part of a larger move that attempts to cut the country off from the international financial system. A second tranche of US sanctions on Iran's oil and gas sector are set to go into effect on Nov. 4. Iranian crude exports, which reach some 2.5 million barrels per day normally, have plunged by over half a million bpd and are expected to dive further when expanded sanctions on oil take effect next month, depriving Tehran of its main source of income, AFP reported. According to the Statistical Center of Iran's latest report, Iran's economy grew 1.7% during the first quarter of the current fiscal year (March 21-June 21) compared with last year's corresponding period. The economy saw 1.9% growth without taking into account oil productions, the report added. SCI released the report a few days after the Central Bank of Iran put the GDP growth for the same period under review at 1.8%, including growth in the oil sector, and 0.7% excluding it. The statistical center says services experienced the highest growth rate of 3.2% among the three major economic sectors. The "industry" group followed with 0.4%. Production by the agriculture sector shrank by 0.8%. The central bank says the services sector grew by 1.1% while the agriculture and the "industries and mines" sectors grew by 0.3% and 0.1% respectively. SCI and CBI both release periodic reports on Iran's macroeconomic data. The results, however, often differ from each other due to different methods used in calculations. Iran’s economy emerged from recession in the fiscal 2014-15 with a 3% growth after two years of recession when the economy contracted 5.8% and 1.9% back to back, according to the Central Bank of Iran. Growth in 2015-16 has been put at -1.6% by CBI and 0.9% by SCI. CBI has put 2016-17 growth at 12.5% while SCI says it was much lower and near 8.3%. With the US reimposing sanctions against Tehran lately and forcing other countries to stop importing oil from Iran, it is expected that growth in this sector will further decline in the months ahead. 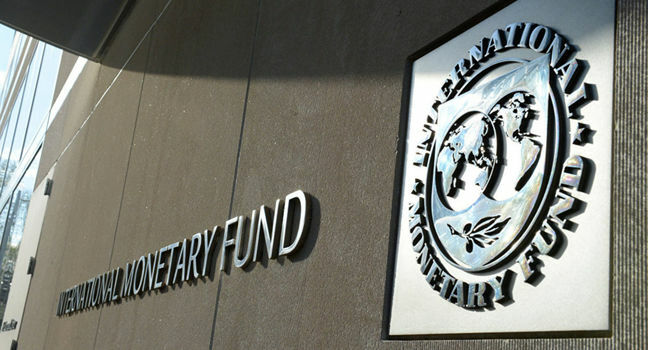 The IMF report came after the World Bank said in another recent report that in the medium term, the Iranian economy is set to experience a downward trajectory as oil exports are expected to fall to half of their 2017-18 levels following the phased reintroduction of US sanctions culminating in November 2018. The World Bank said the economy is expected to contract by 1.4% on average between 2017-21, experiencing a fall in exports and consumption on the demand side and a contraction of the industry sector on the supply side. "Government balances are also expected to deteriorate, as oil revenues account for more than 40% of central government revenues. With exports disrupted, the demand for the US dollar to finance imports and savings is expected to rise and the parallel premium is likely to increase further than the current 150% gap between the official and parallel rates," the WB report said. "Higher import prices from the devaluation are expected to push inflation back above 30% in the coming years, as inflationary expectations spiral and consumer sentiment falls, leading to once again to stagflation in Iran. Despite the depreciation and drop in imports, the reduction in oil exports is estimated to almost eliminate the current account surplus, which is lower than the earlier UN sanctions episode as oil prices are almost half of the levels they were in 2012-13." The World Bank report noted that the economy’s downward trajectory is also likely to put further pressure on the labor market and reverse recent job creation gains. The IMF's World Economic Outlook report also expects the unemployment rate in Iran to increase from 11.8% in 2017 to 12.8% in 2018 and further exacerbate to 14.3% in 2019. According to the World Bank, for the quarter ending June 2018, the unemployment rate improved to 12.1%, as employment growth remained above 3% year-on-year for six consecutive quarters, leading to more than 790,000 jobs being created in 2017-18. The labor force participation rate edged up to 41.1% in the June quarter 2018, its highest level in more than 10 years, while the underemployment rate was 10.4%. Youth (15-24 years) unemployment at 28.3% in June 2018 remains high compared to earlier periods and regional average. Female labor force participation rate continued to improve to around 19.8% in 2017-18. The country ranks among the top countries that improved the participation of females in the labor force, although considerable differences between male and female labor force indicators remain.